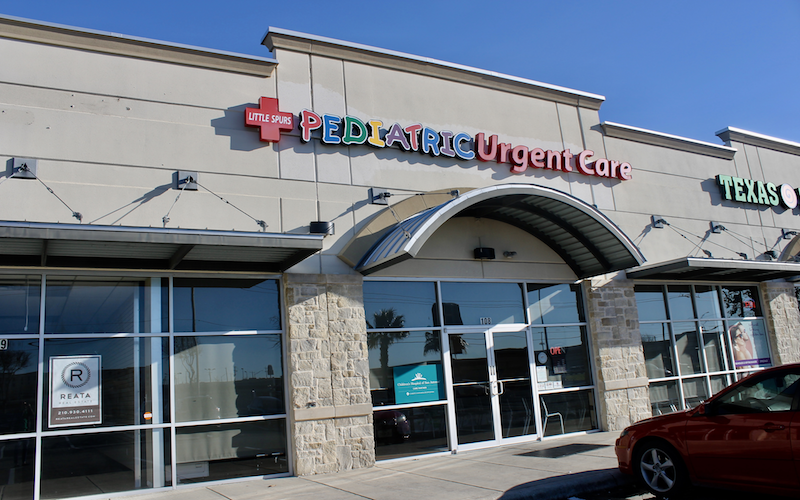 Little Spurs Pediatric Urgent Care, Westover is a pediatric urgent care center serving the children, adolescents and young adults in San Antonio with extended hours, making them a great option 7 days a week when your child's primary care office may not be open. You can find this clinic located at 8403 State Highway 151, Ste. 108 and patients can walk in to see them today from 9:00am to 9:00pm (last verified on 2018-08-11). Recognized favorably amongst their patients, Little Spurs Pediatric Urgent Care, Westover has an average rating of 4.6 stars out of 5 based on 430 total ratings. In fact, recent patients have frequently used words such as "ambiance" to describe their experience at the clinic. When your kiddo is not feeling well and when your regular pediatrician isn't available, you definitely want to look for positive sentiments from kids and parents who have gone before you. Nationally, most pediatric urgent care patients see average wait times between 15-30 minutes before being seen by a provider, which should be expected at Little Spurs Pediatric Urgent Care, Westover as well. The base price for an office visit at Little Spurs Pediatric Urgent Care is $125 with additional services being an extra charge. Patients typically pay between $35 - $125 for common services. Little Spurs Pediatric Urgent Care accepts many major insurance plans and multiple forms of payment, making it easier to get the affordable care you need. It is always a good idea to contact your insurance company before your visit to ensure the Clinic is in network for the service(s) you're seeking. Quick & easy & the staff was very friendly! It was wonderful. I always bring my daughter here if her pediatrician doesn’t have any availability. The staff is so friendly. Front desk was super rude. I had never been to that clinic and was recommended by a friend. I walked in and instead of saying hi how can I help you or what brings you in. All she said was ‘Sign in on the ipad’. Very poor customer service. People like me,go in there because our children are sick. Don’t you think we have enough on our minds and now we need to deal with attitude? Provider and front desk girls were awesome. Such a great experience. For our first time there, I thought it was pretty good. Didn’t have to wait long. Everyone was precise and helpful. Thank you! Staff was so nice, and we got seen quickly. The doctor was very helpful and took her time to answer any questions. Did a follow up courtesy phone call to check up on my little one and answered more questions. Highly recommend and I truly appreciated the time and comfort given to my little one from beginning to end. Our first time staff everyone was helpful outstanding that's what professionalism suppose to be thanks to all. Love coming here staff is always fast. Great facility. Love coming here when we need good care. Friendly staff & was very quick!